You know what I think? I think the whole Europe vs the USA “rivalry” (for want of a better word) in the Metal scene never really went away, we just all agreed, implicitly at least, to stop talking about it as much. Of course I’m not suggesting that there’s some huge, unbridgeable divide between the two sides of the Atlantic, or that the scions of “European” and “American” Metal are some sort of monolith, but there’s still certain unconscious beliefs and biases at play, subtly encouraging you to “root for the home team”, even now. Heck, I can think of several examples off the top of my head where some of my US colleagues have been full of praise for a specific band or album, when all I can think is “but this just sounds like early Emperor” or “these are just a bunch of leftover At The Gates riffs”… and I’m sure the exact same sort of thing has occurred the other way around when I’ve been pushing a band from this side of the pond which they simply don’t see as being a particularly big deal. 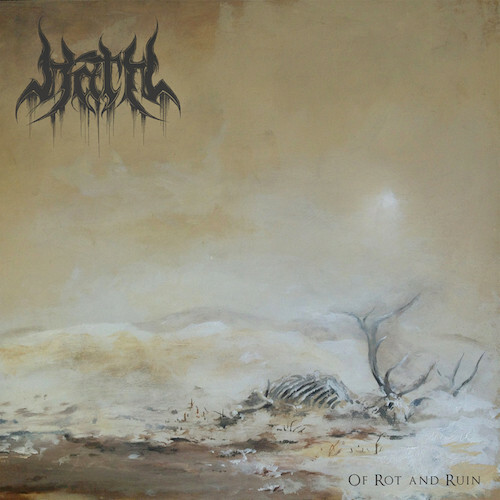 The New Jersey blackened death metal band Hath made an impressive advent in 2015 with an EP named Hive, but their debut album Of Rot and Ruin is nevertheless an enormous (and enormously good) surprise, not a step forward but an extravagant leap ahead. The news that Willowtip Records will release the album on April 12th is being announced today, and to help spread the word we’re premiering the first advance song from the album, the name of which is “Usurpation“.